It’s part of a worldwide Sensation tour, this year kicking off in Dubai on Oct 31, 2014. And it will be making a big splash in Toronto on Saturday, November 29, 2014. 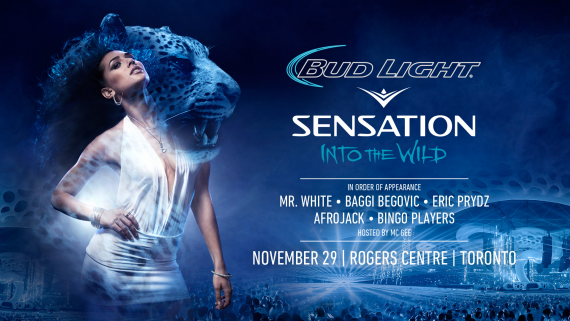 So if you’re not excited about Sensation, you may not have a pulse. Even if EDM isn’t your type of music, you can’t help but be a part of it when you’re immersed in the vibe. The extravagant visuals will probably help a bit as well… just a bit. Check out this quick 30-second teaser video revealing the lineup. The event will be hosted by MC Gee. General admission tickets are $110 + a $13.95 service fee and Deluxe tickets are $250 + a $13.95 service fee. Either way this is an experience you don’t want to miss! I hope to see you there!